The top junior tennis players in Arizona, New Mexico and El Paso, Texas gathered in Tucson, June 9-12 for the Southwest's most prestigious summer tournament, the Junior Closed. 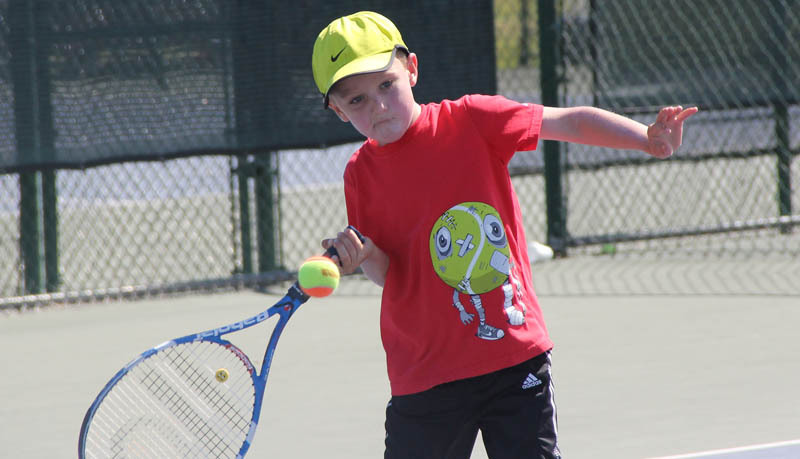 The "Closed" as it's affectionately known, annually brings together the Southwest's top-ranked junior players to crown true ‘section champions’ in 26 separate divisions in singles and doubles, with the range of competitors from 8 and under all the way to 18 and under. The Southwest Junior Closed is an L3, the only tournament in the Section with this point designation, and on par with some of the country's elite national events. It is the Section's highest point producer for ranking purposes and is open only to residents of USTA Southwest. It is also a big determinant for players looking to get onto the Southwest Zonals and Intersectional travel teams. 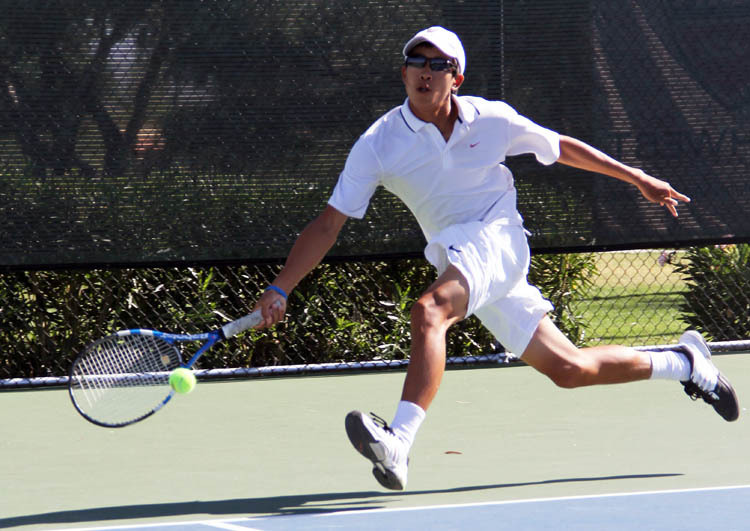 With 372 players in our field this year, the event is one of the largest junior annual events held in the Southwest, and used multiple playing sites to field the numerous draws, including Hilton El Conquistador Golf & Tennis Resort and the El Conquistador Country Club, as well as Tucson Racquet Club and Reffkin Tennis Center. In Boys' 18s, Phoenix's Jason Jaruvang (pictured, right) took out Notre Dame-bound Alex Lawson 6-4, 6-4 in the single final. The top-seeded Jaruvang lost just one set all weekend, and teamed with partner Christopher Krimbill to win the doubles division as well over Augustus Ge (Phoenix) and Robert Seby (Oro Valley, Ariz.). The Boys' 16s was a showdown of brothers, James and Nathan Ponwith of Scottsdale, which Nathan won 6-7. 6-1, 6-1. The two siblings had paired up to win the doubles title over Max Schell and Wilson Lambeth. In Boys 14s, fifth-seeded Nathan Niemiec (Paradise Valley, Ariz.) put on an incredible display over five singles matches, losing just a mere four games in 10 total sets of play, including back-to-back 6-0, 6-0 scores in the semifinals and finals. Niemiec also combined with Tucson's Harrison Reid to claim the doubles championship, downing Carlos Hassey (Surprise, Ariz.) and Brandon Stringfellow. 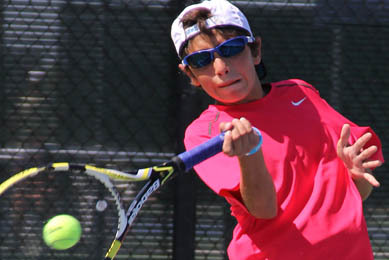 In Boys' 12s, top-seeded Sebastian Herrera (El Paso, Texas) downed second-seeded Maximo Lawlor (Litchfield Park, Ariz.) in the final 6-1, 6-0. Lawlor and Herrera also captured the doubles division, defeating Andrew Fucci (Gilbert, Ariz.) and Harsh Parikh (Tucson) in the final . In Boys' 10s Orange Ball 60', seven-year-old Cole Stelse (pictured - right) of Scottsdale downed nine-year-old Max Majerle (also of Scottsdale) 4-1, 4-1 in the singles final. Stelse then paired with Jordan Craft (Scottsdale) to win the doubles division over the Tucson brother tandem of Brendan and Jared Perry. In Girls 18s, defending champion and top-seeded Stephanie Vlad (Scottsdale,) dispatched fourth-seeded Mariely Hassey (Surprise, Ariz.) 7-6, 3-0, after Hassey had to retire with a foot injury. Vlad also made the doubles final, pairing with Michelle Satterfield. The Vlad/Satterfield duo fell to third-seeded Courtney Amos and Zaina Sufi 8-6. In Girls 16s, second-seeded Maddie Potfhoff (Tucson, Ariz.) upended top-seed Madison Clarke (Phoenix) 6-1, 6-3. The Pothoff-Clarke duo also captured the doubles division, receiving a walkover from Maggie Cohen/Scarlet Rush in the final. The Girls 14s put on the best final-round display, as top-seeded Delaney Nothaft (Tempe, Ariz.)outlasted fifth-seeded Kylie McKenzie (Anthem, Ariz.) in a near three-hour final, winning 1-6, 6-4, 6-4. Shailla Alda (Phoenix) and Sara Kuutilla (Albuquerque, NM) earned the doubles title, downing Nothaft and Taylor Bridges (Mesa, Ariz.). In Girls 12s, second-seeded Elizabeth Isayev (Scottsdale.) took out top-seeded Josie Frazier (Scottsdale) 6-3, 6-3, then paired with Tucson's Jamie Schroer to claim the doubles championship. The Isayev-Schroer combo took out Catherine Broerman (Anthem, Ariz.) and Carmen Corley (Rio Rancho, NM) in the final, 8-4. In Girls 10s Orange Ball 60', in an all-El Paso singles final, top seed Abigail Gorden took out unseeded Mia Angelina Ruja. Gorden also paired with Madeline Snell (El Paso, Texas) to capture the doubles division, beating Brooke Belitz (Scottsdale) and Rimona Rouf (Phoenix) 8-6. An interesting note, all boys singles champions at the Southwest Junior Closed and three of the five girls singles champions also captured the doubles division. Other winners in the SILVER singles divisions included - B18s, Pierre Pfarr - El Paso, B16s Gustavo Cardenas, El Paso; B14s, Jarod Hing, Phoenix; Boys 12, Evan Ferguson, El Paso. G18s, Kelly Maroney, Scottsdale; G16s, Noelle Karp, Tucson; G14s, Lindsay McMillan, Rio Rancho, NM, G12s, Chloe Gavino, Tucson. Congratulations to all of our new Southwest Junior Closed Champions! It was a great four days of tennis. We would be remiss if we didn't thank our volunteers and site directors Sally Grabham, Meghan Houk and Ruth Fuchs, as well as our host sites and their staffs for their support of the tournament. USTA Southwest held a Player Party on the opening night of the event at the Tucson Racquet Club, which included prizes from sponsors All About Tennis and Solinco. Solinco also provided free strings for quarterfinalists in all Gold Singles divisions.